Open Monday through Friday, 8:00 a.m. – 4:00 p.m.
Saturday, 8:00 a.m. – 12:00 p.m. Closed Sunday. Items accepted: Wood, Carpet, Mattress and Box Springs, Couches, Metal, Drywall, Appliances, Construction Debris, Cardboard, Batteries, Tanks for Gas Grills, and Furniture. Items not accepted: Regular Household Garbage, Food Scraps, Wet Items, Liquids, Rocks, Brick, Dirt, Concrete, Brush, and Blacktop. Note: The Recycling Convenience Center does not accept brush. Brush may be taken to the Nicholasville Wastewater Treatment Plant at 2296 Shun Pike. Their houses are Tuesday and Thursday 8:00 a.m. – 4:00 p.m. and Saturdays 8:00 a.m. – 12:00 noon. Call (859) 885-1121. Note: We are a drop-off facility. We are unable to provide pick-up. No Oil accepted. Oil is accepted free of charge at the Road Department. The Convenience Center accepts checks, money orders, debit cards and credit cards. No cash accepted. No separation of recyclables necessary. The above items are recycled free of charge. No separation of recyclables necessary. 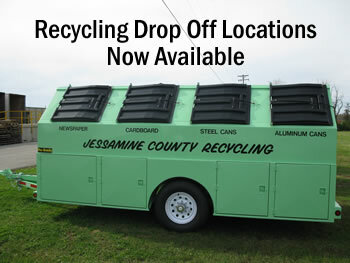 Beginning Jan. 1, 2016, Central Kentucky Hauling will begin residential trash collection in Nicholasville and Jessamine County. Central Kentucky Hauling will replace Rumpke as the trash collection contractor. 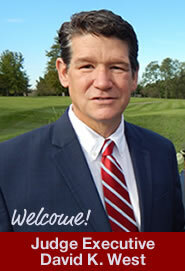 Many of your questions can be answered on their Frequently Asked Questions Page. Then look at the County Service Route Map to check your new pick-up day. Call Central Kentucky Hauling at (859) 225-2521. Option 1. Central Kentucky Hauling (CKY) will pick up 12 bags of leaves per week with weekly pick up at no extra charge. Option 2. CKY will pick up 13 to 30 bags of leaves for $14.25 per pick-up on Saturdays during the month of November. Please call CKY at 859-305-1073 so they can add you to the schedule for Saturday pickup. This is a prepaid service. Option 3. 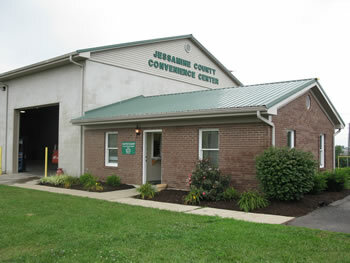 Jessamine County Fiscal Court has an agreement with the City of Nicholasville to dispose of brush and leaves. You can take your un-bagged leaves and brush to Nicholasville Waste Treatment Plant located at 2296 Shun Pike, Nicholasville. Their hours are Tuesday and Thursday, 8:00 am – 4:00 pm and Saturdays 8:00 am – 12:00 noon.